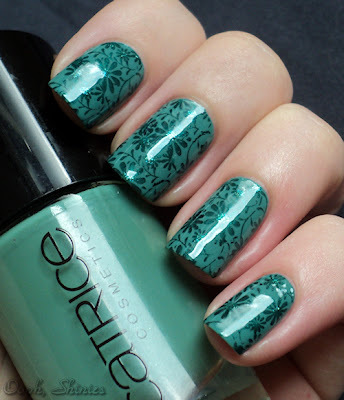 When I bought Catrice I Sea You! I didn't use these kinda colors, but they looked so nice in the bottle so I got a bunch anyways (addicted? me? nooooes). But nowadays I do use them and I'm glad that this one's in my stash as well, it's a lovely color. It looks a bit more green now with the stamping, but it doesn't give me lobster hands, yay!